If you drive the southern route between Frankfort, the capital of Kentucky, and Oklahoma City, Oklahoma, your halfway point will be Memphis, Tennessee. The route forms an arc, a shape on the minds of many on this 50th anniversary of the assassination of Martin Luther King Jr. Paraphrasing the abolitionist Theodore Parker, Dr. King famously said, “The arc of the moral universe is long, but it bends toward justice.” King was gunned down on April 4, 1968, while supporting striking sanitation workers in Memphis. Half a century later, thousands of teachers are on strike from Kentucky to Oklahoma. The teachers’ strikes are part of a national revolt that has been growing for months, arcing from one red state to another. First, in West Virginia, teachers went out on a nine-day, wildcat strike, winning a wage increase and important health insurance protections. In Arizona, teachers have organized protests to demand a pay increase. And in Oklahoma and Kentucky, teachers across both states have walked out. One of the striking teachers, Andrea Thomas, and her husband are both longtime public school teachers in Oklahoma City. She explained the four-day school week, a cost-cutting maneuver used in many districts across the state: “We are relying on that fifth day now for our extra jobs … I clean houses. My husband, he even sells plasma.” That is, his own plasma, a blood product. Attica Scott, the first African-American woman to serve in the Kentucky Legislature in over 20 years, added: “We need more of that righteous anger that Dr. King had. We need more of the people descending on their state Capitol and saying that Kentucky deserves better.” She explained how the Republican-controlled Statehouse gutted the state pension program last week, surreptitiously changing a sewage treatment bill: “On the Thursday before Good Friday, that morning, it was a sewage bill. And by that afternoon, it was the so-called pension reform bill.” She added, “The governor and his followers in the Legislature are determined to destroy public education.” Sitting next to each other, both McCoy and Rep. Scott wore red as part of the “Red for Ed” theme that created a flood of red in and outside the statehouse. 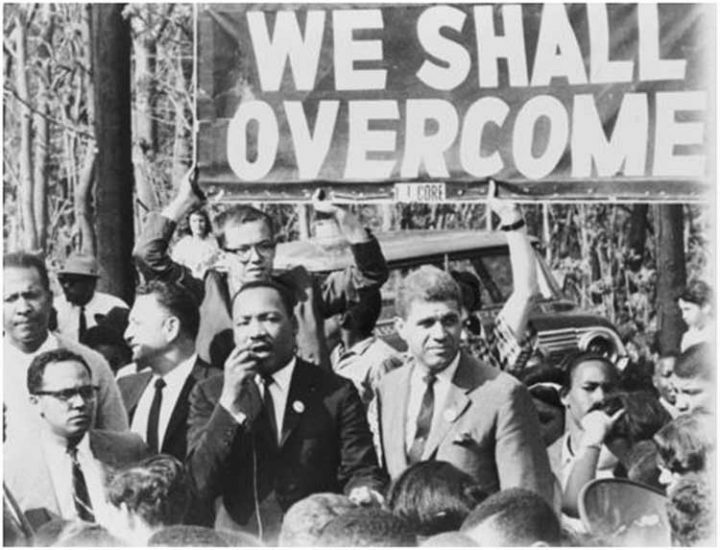 One of King’s closest allies, his mentor in the practice of nonviolent civil resistance, was the Rev. James Lawson. Lawson is still alive, still organizing, and, as King would have been, is 89 years old. There is an arc, between communities in struggle, between generations, an arc in time that Martin Luther King Jr. said bends toward justice. King shed his blood many times, suffering injuries and attacks throughout his life. He shed it finally in Memphis, working in solidarity with striking workers. Fifty years later, a teacher in Oklahoma sells his blood to make ends meet. The struggle continues.